Possibly the most technical trail ever ridden! 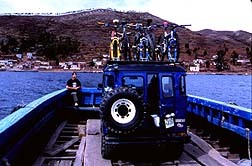 The latest Hans Rey adventure took place in Bolivia/South America. The challenge was to cross the Andes and drop into the Yunga (jungle) on a pre-Inca trail; and as it turned out, it might have been the most technical trail ever ridden on bicycles. Part of our team was Sara Ballantyne, a former XC World Champion, who had just returned from Morocco where her team had won the Eco-Challenge. 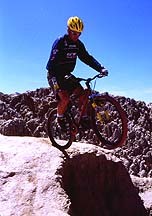 Ira Vick was our third team member, an up and coming pro downhill racer (1997 NORBA Natl. DH Champion Semi Pro). He is an excellent all-around rider with downhill, BMX, and trials riding skills. Ira is also a member of the infamous Laguna RADS bike club, an underground mountain biking group which is known for riding steep, technical and bushy trails. Jeff Wemmer from Camelbak was our guide, since he had been several times to Bolivia and was very familiar with the country and the people. 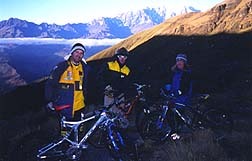 The main purpose of the trip was to film a 1 hour TV Show (Adventure Quest) for the Outdoor Life Network, which will be televised sometimes in spring of 1999. The TV crew and organizers of the trip were noneless than EMI award winning filmmakers Roger and Nick Brown. 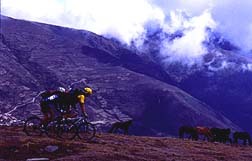 Our motto was to follow the footsteps of the Inca on bikes. The Incas were a highly advanced civilization who ruled between 1200 AD and 1533 AD throughout South America. The Inca had no knowledge of the wheel, and accordingly were their trails built. In fact, I was often wondering, why they even refer to it as a trail; because the irregular rocky steps were so steep, slippery, eroded, overgrown, and often alongside deadly 1000 foot cliffs. The main goal of our journey was to conquer the legendary “Yunga Cruz” trail, which took us about a week and was supported by 11 mules to carry our food, tents and camera equipment, 5 mule drivers, and a cook. “RADS-style” skills were required, including tripodding (dragging one foot on the ground while literally sitting on the rear tire). Ira’s description of the trail was: “Imagine riding the gnarliest 50 yard section of a World Cup downhill race course for 10 miles!”. Ira and myself had a blast, as we almost rode the whole trail, way more than we expected to ride. My new GT i-drive XCR 1000 (Rockshox Sid’s front and rear) worked perfect; I had no technical problems, not even a flat tire on the entire trip. Sara killed us on the uphills, and after a couple of days of learning how to tripod and finally lowering her seat, (what she principally never had done before) she also got the hang of the downhills. Just like Jeff, who literally carried his bike up and downhill for the first few days. It wasn’t just the high altitude which made us tired, but the riding of the trail required so much concentration and strength, you couldn’t take your eyes of the trail for even one second. It was just one technical difficulty after the other. My neck was sore from looking up while riding downhill steps all day long. You had to be experienced in reading lines quickly. The better you are, the more techniques you know and the more possibilities you have at any given situation. Where Ira and myself could see 2 -3 different lines and picked the most efficient one, or the most direct one, or the least dangerous one, or fastest one, or dryest, or funnest one, or …; Jeff might have only seen one line or like in many cases none. Not that Jeff was a bad rider, not at all, but this trail was just in a class by itself. It¹s a lot about knowing your limits. You want to push them all day long but you can¹t afford to overstep them, the price is just too painful – in some cases it could be deadly. Important was also the right choice of equipment, a full suspension, lightweight bike, flat pedals, and multi functional clothing as the weather changed every 30 minutes drastically. The last couple of days lead us into the jungle where our mule drivers went ahead of us to clear the trail which was totally overgrown with axes, machetes, and saws. The temperature during the nights were around the freezing, while the days were humid and hot. Our Bolivian Adventure turned out to be very fun and successful, I was stoked on the difficulty of the trail and the useful application of my trials riding skills. I can’t wait to relive our adventure when the TV show Adventure Quest airs.